I used to work for an amazing Creative/Digital Innovations agency called The SuperGroup. The co-workers were inspiring. The work trips were amazing (Disneyland and Dominican Republic). They let me work from home when needed, paid me well and had a kegerator. I loved it. But I quit. I wanted to spend more time with my kids and take on freelance projects instead. Actually, wait. I'm lying to you. I didn't want to take on side jobs (though I have). I honestly wanted to be "Domestic" for a while, have the flexibilty to volunteer and needed to figure out what I wanted to be when I grow up. A year later, I'm still trying to figure that out, but think I'm a little closer. Maybe. One 'job' I've been trying on for size is being a Standup Comic. At this point, I'm more of the intern in the mailroom. I've got a lot to learn. Watch my latest performance at The Atlanta Improv from December 2014 and let me know what you think. 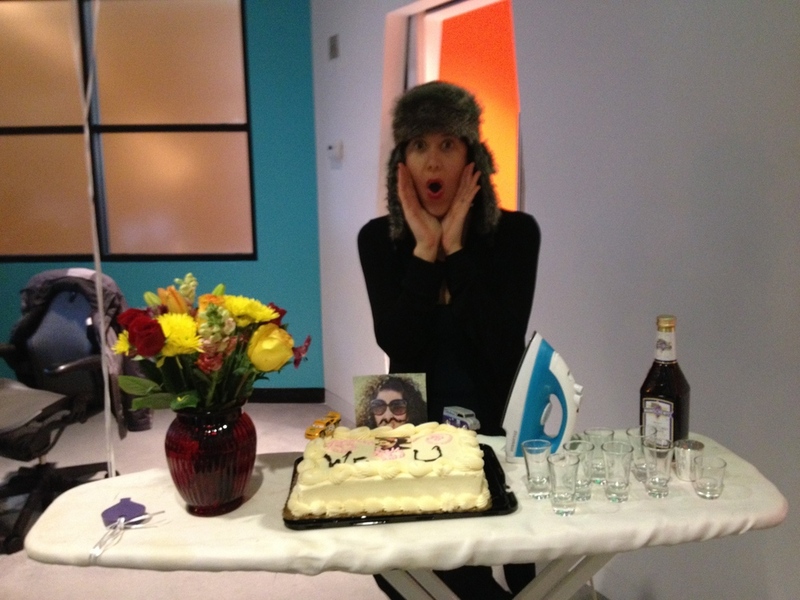 My going away party at TSG with a face cake, and shots of Manischewitz all displayed on an ironing board.